Find the best Halloween haunted houses in California 2018. The state has many haunted attractions featuring lots of zombies, demons, vampires, devils, and Freddy’s that work in Hollywood. We have separate attraction links and listings for haunted houses USA, haunted corn mazes, haunted trails, haunted zombie paintball, haunted forests, haunted hayrides, and ghost tours. Our new updated TOP 100 HAUNTED HOUSES FOR HALLOWEEN 2018 . Also check out our list of the Top 100 Haunted Houses 2017 in America. Is your favorite haunted attraction on the top 10 and top 100 state list? California has some of the largest Scream Parks in the US. Hollywood keeps producing scary characters. Enjoy a movie and take your friends to a fun house this October. You will love the thrill of being scared out of your mind. 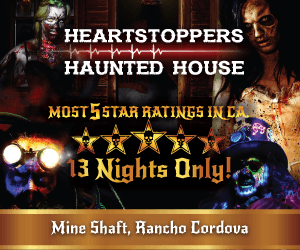 We ask is that you don’t let any of the ghosts escape from their California haunted houses. We can’t have them taking over the internet by invading Silicon Valley. Thank you and enjoy. Opens October 12th for scary fun. Blind Scream operates at the Sonoma Mountain Village. It runs starting at 7:00 pm and closes at 10:00 pm or 11:00 pm on Friday and Saturday. This years attractions include walk through outdoor mazes Blackout, and the all new attractions Uncle Chuckle’s 3D Mad House, plus the new haunted house Slaughter Shack. Check webpage for additional dates. It runs Thursday through Sunday in October. Sorry folks. This haunt will not open in 2018. They are searching for a new location. Cemetarium operates the 20,000 square foot haunt that opens October 12th. Psycho Cirucs is their 2nd attraction. Check their web page for details on which event is happening on the night you want to go. It has over 100 volunteers working each night. It opens their Full Scare show on Saturdays in October. Attractions include KAUS, Alternative Therapy, Zombie Heights, Hallway of Fear, and the all new Psycho Circus. Doors open at 7 pm. Tickets are for the combo low scare ticket or for the full scare combo ticket. Individual tickets to a single attraction are less. They operate as a low scary family facility on select nights. They open for full scare on Saturdays. Creep is located at 2316 N. San Fernando Rd. in Los Angeles. It takes about 60 minutes to go through this multi-sensory experience of fright. You go through the attraction in groups of 8 to explore the hidden scenes, intimate encounters and moments of fright. Expect to be scared. Opens September 27th and runs Thursday through Sunday nights in October. CREEP IS A FULLY IMMERSIVE, MULTI-SENSORY, WALKTHROUGH EXPERIENCE. GUESTS ARE GUIDED BY A CAST OF CHARACTERS INTO A REALM OF FRIGHTFUL SITUATIONS AND ONE-ON-ONE ENCOUNTERS, ALL DRIPPING WITH STYLE AND DREAD. Open October 26th, 26th, and 31st. The Cursi House of Screams haunted house has been scaring people two decades and we’ve enjoyed it as much as you. The haunted house is run by family and friends. We do not have a cover charge but appreciate donations or assistance to help continue this tradition. This is their final year. Open every Friday, Saturday, and Sunday beginning September 28, 2018. Tickets are available for Dead Time Dreams. It features the twisted maze Meat Factory and the zombie apocalypse haunt The Church. There is also a midway of terror wait area with freaks, creatures and shows each night. Doors open at 7:00 pm. Doors close 11:00 pm weekdays and 12:00 am weekends. They have free parking. Also open some added dates Halloween week. No longer do you stand waiting in line, now you have a whole Midway of Terror to entertain you even before entering the two attractions. This year, the experience will be a whole detailed pre-show that gets the mood or was it blood flowing, even before you go facing the dark passageways of horrors. See the Freaks and Creatures that have never been seen before, special nightly shows that are different happenings each night, The Midway of Terror is a dark and intense experience which is better than most haunted attractions you will have ever experienced before! The new theme is Welcome To The Crate. Experience screams, tears, and fear during their 4 nights of fright beginning late October. They might not open in 2018. Keep checking their facebook page or web page. The fun begins September 28th. The three haunts at Fear Overload are Static Noise, The Plastic Surgeon, plus Live Horror Entertainment. A high shock attraction with horrifying scenes about San Francisco’s grisliest serial killer. You Psychotic takes you into a labyrinth experience through the paranormal. Are you next? Costumes can be worn but leave the face paint and mask at home. Tickets start at $25.99-30.99. Doors are open at 7:00 pm until 12:00 am on most Friday and Saturday nights or 10:00 pm on other nights. Caution this is a very scary haunt with some of these for very mature audiences only. They are open nearly every day in October. Runs most nights from September 28th through November 3rd. Check their webpage for schedule. Field of Screams operates 4 haunted mazes and 2 scarezones. Each are themed for the maximum terror. Doors open at 7:00 pm each Thursday, Friday, and Saturday in October beginning October 5th. All new scenes, mazes, creatures and entertainment for 2018. Over the years we have grown bit by bit and they expanded from one yard to two, creating a path that winds through two yards with many experiences including the original cemetery (evolved), pirate grotto, swamp, haunted forest, mad science lab and spider lair. Every year some things change and some stay the same. The haunt has gotten bigger, smaller and then bigger again. It is always an adventure to create this haunt along with our friends who volunteer to build and act in the haunt. We invite you to come enjoy our haunt with us! Caution as we are concerned this popular haunt will not open in 2018. Their phone is disconnected and their web pages and Facebook page have not been updated. Halloween Haunt opens September 21st. The amusement park Great America operates a Halloween haunt on Friday, Saturday, and Sunday. The haunt runs from 7 pm to midnight. The regular park is open Saturday and Sunday in October from 10 am to 5:30 pm. There are several days and nights that are family friendly including Snoopy’s Trick or Treating. Check website advance ticket prices. Seasonal event starts September 14th. Open Thursday through Sunday nights. Explore some of the haunted houses and attractions in the theme park. Tickets online for Horror Nights and park admission are as low as $69. Don’t miss attractions Walking Dead, Evil Dead, Insidious, Black Sabbath, El Cucuy, or Universal Monsters. Have fun exploring the 7 terrifying mazes, the terror tram, scare zones, and the new Jabbawockeez Show. Daytime park admission is separate. Night time hours are generally 7:00 pm until 2:00 am. Halloween Horror Nights has more than 765000 Facebook likes. Also check out our list of the Top 100 Haunted Houses 2017 in America. Is your favorite haunted attraction on the top 10 and top 100 state list? Halloween Time begins on September 7th. The park has been converted into a not scary but beautifully displayed Halloween theme. You get all the Disney rides both day and night except for the 13 nights that are reserved for Mickey’s Halloween Party. Both are lots of fun for the kids and adults alike. Mickey’s Halloween Party is a separate event in the park that starts on September 20th and runs select nights. It features separate shows, autograph signings, rides and more with Disney’s scary characters from hit Disney movies. The Haunted Trail is a stroll through the park you will never forget. Enter the mile long Trail through the twisted grove of pines and gnarled oaks of San Diego’s world-famous Balboa Park! This year, you can get up close and personal with horror icons like Pennywise, Leatherface, Freddy, and Michael Myers. Open Wednesday through Sunday starting September 28th. Hawes Haunts opens on Friday and Saturday nights starting October 5th. It takes place at historic Hawes Farms which is famous for varioius weekend events including a great corn maze. The daytime maze starts September 29th and runs through October. Sacramento’s longest running haunted attraction brings the fright to the area beginning September 29th. Open Friday and Saturday nights in October plus some added dates. All attractions are redesigned and updated with Asylum taking over the top floor as the insane asylum. Deadlands is our outdoor attraction new for this year. It features a walking dead type theme set in an old West town. Underlands features an all new 3D haunt with a terrifying walking trail in search for Alice. Enjoy lots of carnival food, amusement rides, games and souvenirs for hours of fun. Free roaming zombies and nightmarish creatures add excitement around each corner. Of course admission is just $25 for entry into all the haunted attractions. Fast pass and annual pass options are available. Check website for dates and complete details. Appears this attraction has closed. Noted writer, director, and producer David Scott Harris brings the House of Blackbeard Haunted House to Lafayette, California. Now in its 10 th year Blackbeard is a modern high startle attraction. Doors are open from 7 pm to 10 pm. Location is now at 980 Janet Ln, Lafayette, CA 94549. Holy Cross Lutheran Church hosts their fifth annual haunted maze, opening October 19th 2018 and running Fridays and Saturdays from 6pm to 9:30pm for the two weekends before Halloween. Suggested donation is $5. The Scary Farm begins September 20th. Now part of Cedar Fair this Halloween event continues its forty year history of quality family entertainment. The Scary Farm in the month of October generates so much activity it is responsible for nearly half the annual revenue for the whole park. The theme is Nowhere to Hide and once you are inside the park the mazes, shows, rides, actors, and haunts really bring the scares to you. It features 11 mazes and two Halloween shows and thirteen thrill rides. It is one of the largest Halloween events in the country. Generally open Thursday, Friday, Saturday and Sunday in October plus some added dates. The attraction opens September 29th. In my opinion this is a must see attraction. Started over 10 years ago the owners are opening more haunts across the country. They expect record crowds this year. Famous businessman Mark Cuban invested a half million dollars in this enterprise. It must be good. There are three attractions at the Los Angeles Haunted Hayride. The haunt is open Friday, Saturday, and Sunday nights plus additional nights in October. Doors open at 7:00 pm. Tickets for the Hayride vary by date. A combo ticket for the Hayride, In Between Dark Maze, House of the Horseman, Seven Sins, and Purgatory are discounted. Caution you can get wet on the Hayride. There are online discounts available on certain special nights. Los Angeles Haunted Hayride has over 43000 Facebook likes. A really well done annual home haunt that runs on Saturday, October 27th and Wednesday, October 31st. They feature an outdoor carnival and their haunted maze. It is a free to the public event. This attraction is open year around every Friday and Saturday night. You need to call 858-672-2848 to reserve a ticket and find out the secret location. This is an experience unlike any other around. The actors here can and will touch you. Expect to be roughed up. All new this year is their new facade and mazes. Based on a serial killer theme. The season begins October 5th. Located at the Pleasanton Fairgrounds, Pirates of Emerson is a full entertainment complex. It has run for 26 years and now features 6 haunt attractions plus the Dark Gauntlet for the one low price. Included is live music, dancing, and entry into Pirates of Emerson, Laboragory, Holiday Horror, The Hackshack, and Dark Gauntlet. The times are 7:05 pm to 11 pm most nights. Open every Friday, Saturday, and Sunday nights in October plus some added dates. Check web page for details. This season begins on September 29th. Reign of Terror has run for 19 years. Tickets for this 23,000 square foot haunt start at $15. It is open Friday and Saturday nights plus additional nights closer to Halloween. The four attractions here are Haunted House, The Asylum, Blood Manor, and Miner’s Revenge. It has over 105 bone chilling rooms. Find it at Janss Marketplace above Gold’s Gym. The Rotten Apple opens October 20th. It runs the last 2 Friday and Saturday nights in October plus Halloween night. Presents The Not So Enchanted Forest from 7PM to 10PM on 5 nights in October. They have free admission but donations are requested to support their charity. This year they support Volunteers of Burbank Animal Shelter. Savage House opens October 4th. Get immersed in a twisted storyline. They operate a Haunt attraction for $18 and a Museum for $5. They are open Thursday through Sunday nights. Check their website for additional dates and times. Free Parking. They are located in the Target parking lot at the Westfield Mission Valley. All new location featuring 150,000 square foot space with three major haunted attractions. Opens up on September 28th. Sinister Pointe Scary Place runs every Thursday, Friday, Saturday, and Sunday nights. Features attractions, live stage shows, interactive frightening games, concessions, and of course a lot of terror. Attractions are Phobias, Evil on 2, The Boogeyman Express, and Scream Zones. The attraction opens September 28th. Named one of the best in the nation, this Scream Park is produced by the twisted minds of the international metal band Slipknot. Three outrageous haunted attraction plus live horror entertainment. Attractions are Prepare For Hell, Clown’s Playhouse, and Skin Ticket. Parking is free. General Admission is $25-30. Yes be afraid, you should be very afraid. Open most nights in October. The 17th Door is open 25 nights this Halloween season. The theme is based on a story of psychotic rage, prison, and madness. Open Friday and Saturday nights in September starting on the 21st. Open most nights in October. Regular tickets range from $23-31 depending on the night. Check their website for additional information. Despite previous postings to the contrary, the haunt will be open as it always is on October 30 and 31st from 6:30pm until 10pm. New season begins September 21st. Open Friday and Saturday nights in September and Wednesday through Sunday nights in October. San Diego’s longest running haunted house is back again for 2018. Escape the tortuous Dissectors, hop aboard the Clown Subway or enjoy creepy doll island. Tickets are $20 cash or online at The Haunted Hotel. A haunted theatre attaction from Zombie Joe’s Underground Theatre Group. Presented Friday and Saturday evenings from October 5th to November 3rd, including shows on Halloween (10/31). Fresh off their Edinburgh Festival Fringe tour, visitors are guided through a terrifying “Urban Death” maze of horrors, monstrosities, spirits and more! Sometimes the nearest haunted house to you may be in another state. If you live near the California border, or you are headed for a weekend in Vegas, there is probably a haunted house that is worth considering there. I’ve located these close states with haunted attractions for you to consider in addition to the California haunted houses. Have you bought a ticket to one of these haunted houses? Future visitors would love to hear what you thought. Did you have a good time? Was it worth the money? Would you suggest it to visitors here? Any suggestions to maximize your experience? I’ll gladly publish what you send me and give you a great big hug. Please add Ultimate Terror Scream Park to your list of haunted house events. It is located in Sacramento, CA. Thanks for the props for LA Haunted Hayride. Just wanted to fact correct a couple items. Thanks again for the love.